Several years ago I created some Barbie doll sized papercraft, so I was delighted this week to discover I am not the only one! 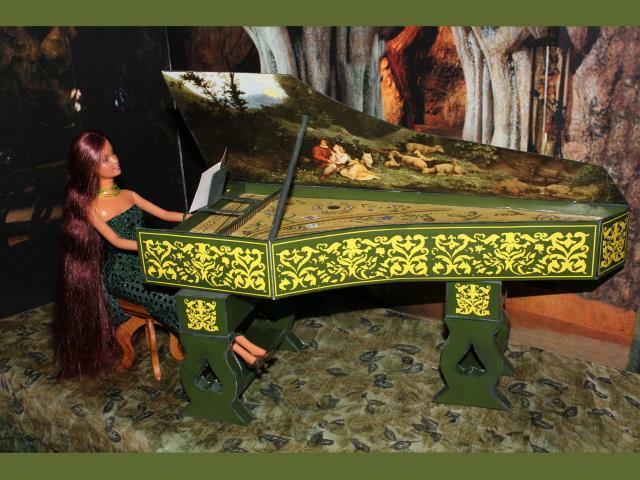 This Barbie scale Baroque harpsichord paper model was created by DeviantART member Menkhar. 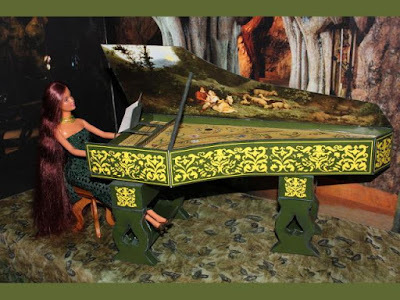 A PDF file of the printable template for the harpsichord may be downloaded here. Harpsichords were popular in the seventeenth and eighteenth centuries but eventually fell out of favor after the invention of the piano. Some scholars associate the Tower of Babel in the Bible with the ancient city of Babylon. 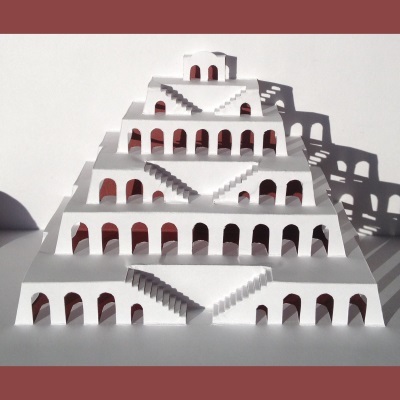 So it is no surprise this Tower of Babel paper pop-up was designed by Elod Beregszaszi to be in the form of a Babylonian ziggurat. A PDF template for the tower may be downloaded here. The 1983 television mini-series "V" tells the story of the invasion of Earth by aliens. The aliens appear to be very human looking, but are later revealed to be reptilians who wear disguises to hide their true features. 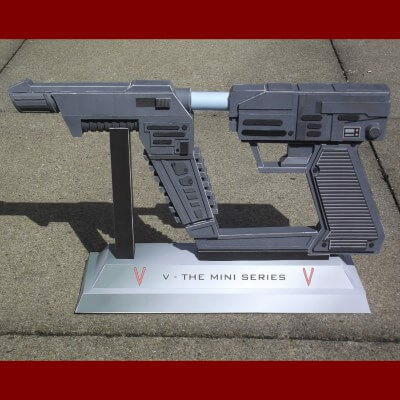 This full scale paper model of a reptilian laser pistol from the series was created by Marcell von dem Berge. A printable PDF template for the model may be downloaded here. Fun trivia: actor Robert Englund (who went on to play Freddy Krueger in A Nightmare on Elm Street) played one of the reptilians in V.
It's only two weeks till Avengers: Infinity War is released! Here's a Marvel Comics papercraft to make while you wait. 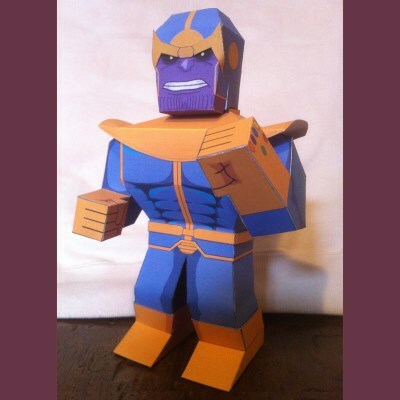 ^^ This paper toy is the arch-villain Thanos as he appears in vintage comic books. On his left hand is the Infinity Gauntlet with all Infinity Stones in place. Thanos has made some cameo appearances in previous movies, but in Infinity War he will play a major role in the story. This paper toy was created by DeviantART member wackywelsh and may be downloaded here. 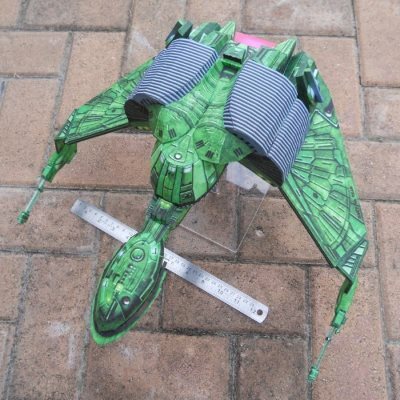 This delightfully cartoon-ish paper model of the G1 Decepticon Laserbeak was created by Asd Fla. The PNG template for this papercraft may be downloaded here. In the Transformers universe, Laserbeak is a Decepticon spy who transforms from a cassette tape into a bird-like fighter jet with laser cannons. The group of Decepticons that transform from cassettes into various robot animals are also known as "Recordicons". Here is another amazing papercraft animal from DeviantART member DrWheelieMobile. This time she has tried her hand at a prehistoric animal: the smilodon. 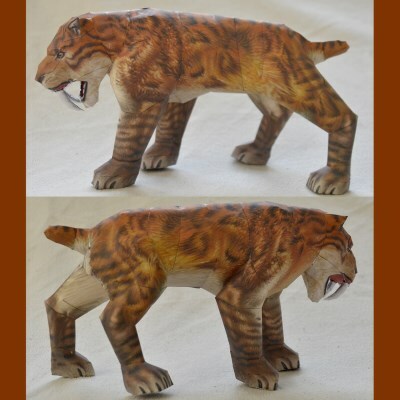 In pop culture, the smilodon is better known as the saber-toothed tiger. The smilodon became extinct a mere 10,000 years ago (not that long ago in the natural history of things). More skeletons of the animal have been found in the La Brea Tar Pits near Los Angeles, California than any other location. The printable template for this paper tiger may be downloaded here.